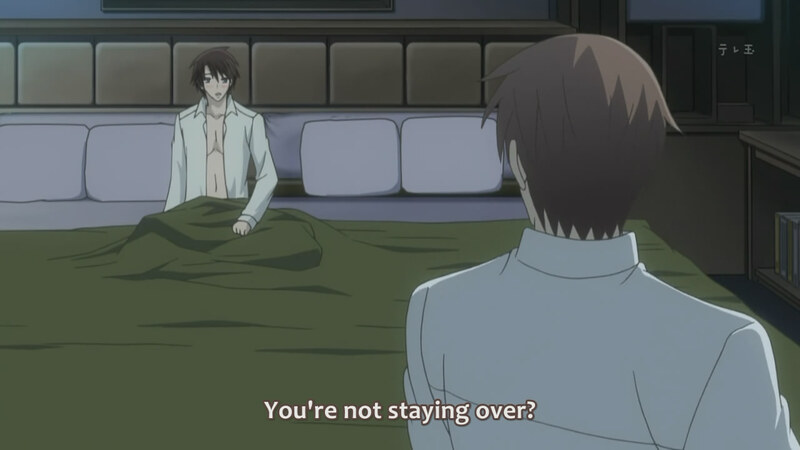 After a long break from anime (forced on me due to Real Life Things), I chose to get back into it with some BL. 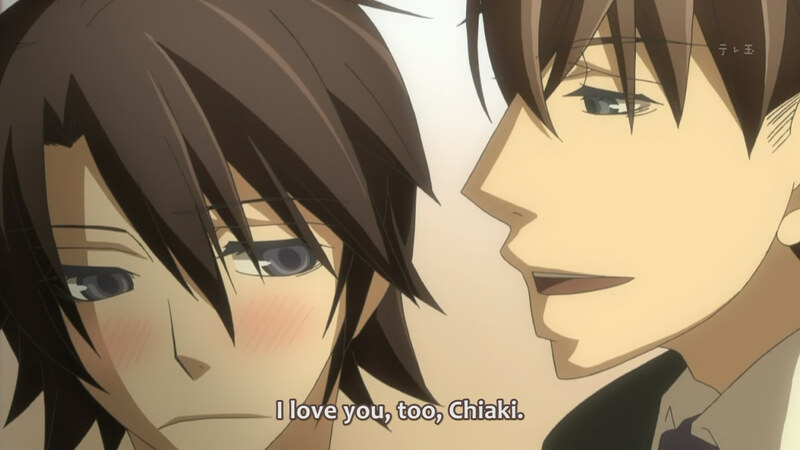 It was either this or Kimi to Boku, which is pretty borderline BL in itself. I just wanted feel-good without the slowness (Tamayura) and with a steady plot that didn't feel erratic (Un-Go). This batch began with another Hatori-Chiaki-Yuu story, hopefully once and for all settling the Yuu matter so I can stop referring to them as a triangle (probably not, though), and then contained another heartwarming Ritsu-Takano story. I must say, watching ep04 was kind of irritating as I worried about all the possible ways it could go off into the dark side, but it ended as unrealistically cheerful as always. The Ritsu-Takano story progressed their situation by leaps and bounds, rekindling my hope that maybe they're finally out of the courtship and into a relationship. Ep04 began by showcasing Chiaki's dependence and attachment with Hatori; I don't understand why they don't just live together already. In fact, I don't understand why they didn't live together even before they got together; they were such good friends and Hatori was always over anyway. Seriously, people and their wasting of money on rent... Anyway, Chiaki obviously wanted more in the relationship, and the episode was clearly heading into the "confession" territory, which is a nice touch after the way ep03 ended. The matter of Yuu was always around, as Chiaki still thought of him as a friend and called him up to hang out in order to alleviate his boredom. I did empathize with Hatori quite a lot; it's sad that Chiaki seems to be walking into the danger zone that is Yuu so often. What the hell? Have you never held a knife before?! Chiaki's happiness and excitement for a date with Hatori was dashed when the editor turned out to be busy with work. In bitter retaliation, he decided to head out by himself, running errands (like buying manga) and trying not to feel bad about not getting to watch the new movie, Panda Warrior (is this supposed to be a play on Kung-Fu Panda?). I wonder if the general Japanese population still goes to theatres to see movies; I understand that it would be kind of weird if Chiaki talked about pirating given that this is an anime and the essential reason some studios are backing CrunchyRoll is to stop some of the pirating. Abruptly ending my tangent, back to the episode. Chiaki invariably managed to see Hatori with some random woman and felt insanely jealous upon realizing that this was Hatori's ex-girlfriend from high school. How coincidental! I live in a city, and I assume that these people do as well, and I've never really "ran into" people anywhere, especially not at such critical moments. I suppose Chiaki could have been near Marukawa when this occurred, increasing his chances... At any rate, Chiaki's anger drove him to yell at Hatori (on the phone) and then run to Yuu - again. I sincerely worried about this scene, as Chiaki began drinking and Yuu kept drawing him. When Hatori called Yuu's house, the scene took the typical turn of Yuu telling Hatori that he was going to steal Chiaki, hanging up the phone, and then returning to Chiaki in order to attempt some forceful touching. I was happily surprised to see Chiaki punch Yuu - surprised and satisfied, because too often in BL the uke is shown as a pansy. 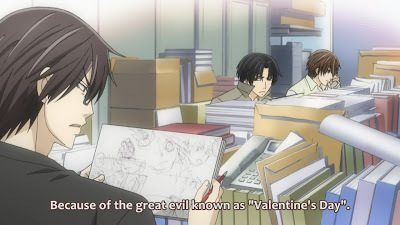 I hate Valentine's Day too. 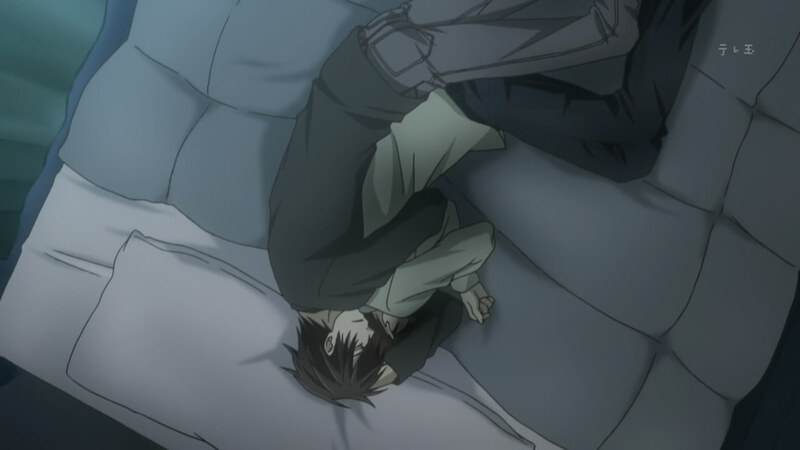 Ep05 returned to Ritsu and Takano, showing the situation in the department at the start of the year. Due to the special issues printed for Valentine's Day, the editors were extremely busy (despite being extremely busy before the Christmas break, too; what a tough job). The situation with Takano advising Ritsu on getting a mangaka to listen to the editor's storyboard changes paralleled with the personal Ritsu-Takano situation a little bit; Ritsu was obviously trusting and depending on Takano a little more. 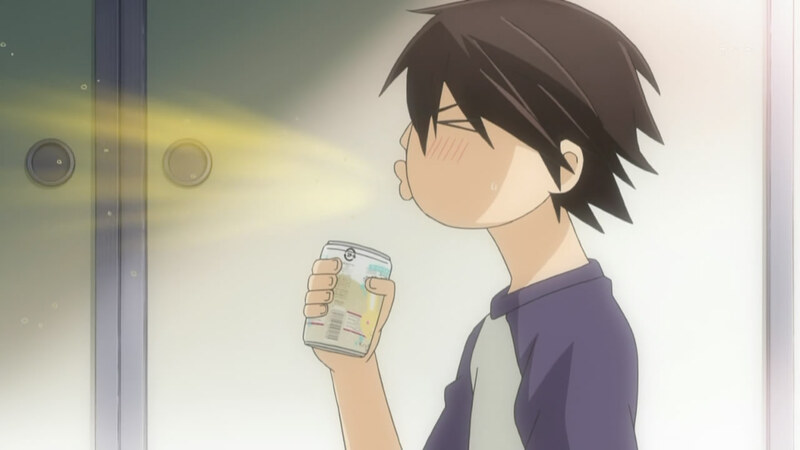 In similar vein, it was also nice to see that Ritsu has been advancing career-wise; whereas he used to need Takano's assistance in getting through a meeting with the higher-ups (where he'd have to justify his decisions), he was able to get through the one showed in this episode on his own. 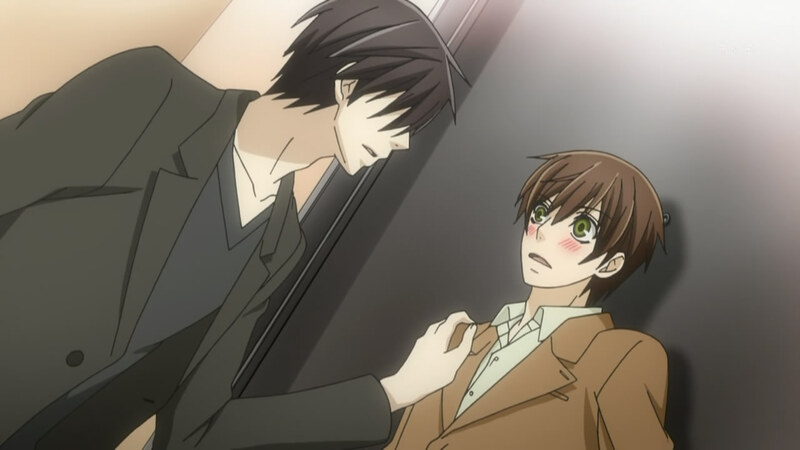 I can't tell if Takano was saddened by that - that Ritsu wouldn't need his help any more - or pleased by it - Takano seems to want an equal rather than a subordinate. Wow, those are some seriously red cheeks. 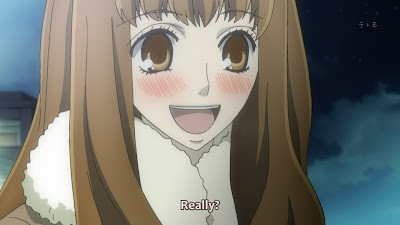 The plot device for the week was Ritsu's fiancee (Kohinata An), finally putting my confusions and questions to rest. Apparently, Ritsu's parents got together with his childhood friend's parents and decided to have their children marry, but Ritsu never took it seriously. 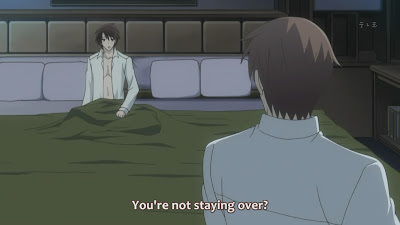 This makes it clear that Takano has always thought that Ritsu left him due to his fiancee (whereas Ritsu's reason for leaving was actually much weaker than that). 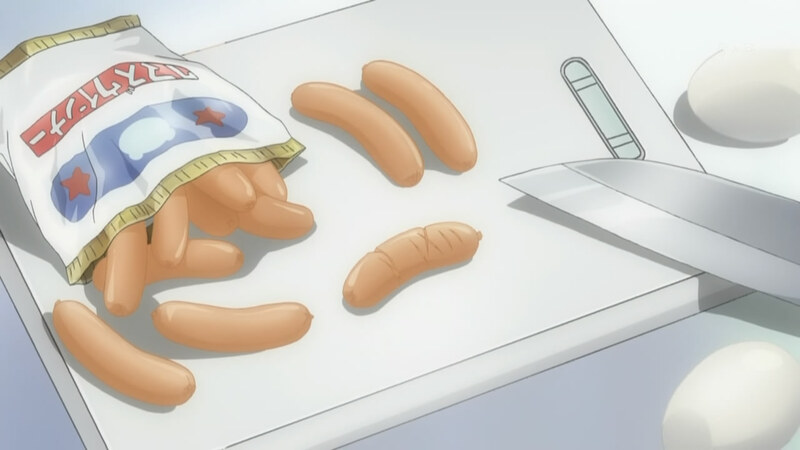 While Ritsu grappled with his feelings about Takano, An showed up to give him a present. 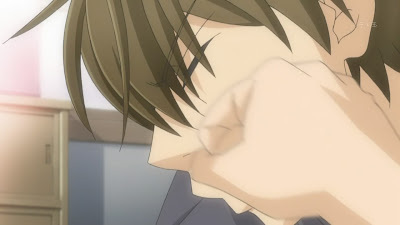 She wasn't overbearing at all and were I not on the Ritsu-Takano ship, I wouldn't think she was annoying. But I am, so I do. Women have no place in BL. And yet I never see them cleaning up the messes they make. The next episode seems to focus on Chiaki and Tori (I think...? ), so I'm pretty annoyed with the shift away from Ritsu and Takano. I want to see more about them! I really can't tell how much of a couple they are at this point; they're still really skirting around the issue. Oh well; there's pretty much the entire season left to go.